FUJIFILM Corporation (President: Kenji Sukeno) is pleased to announce the release of the “instax SHARE Smartphone Printer SP-2,” the smartphone printer which can print high-quality credit-card sized instant photos from smartphones in just 10 seconds. In recent years, the number of photos taken by smartphone users has been increasing. Photos are usually shared with friends through SNS such as Facebook and Instagram and people enjoy using filters and editing their favorite photos. 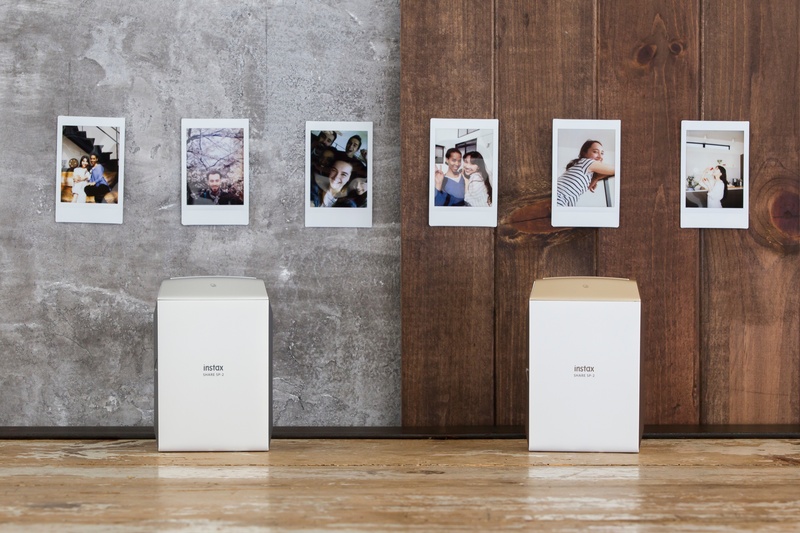 In order to meet the rising demand of users wanting to create photos from their smartphones, we introduced the “instax SHARE Smartphone Printer SP-1” in 2014. This product has been well accepted by many with its features that enable users to print instant photos easily anywhere, anytime. The “instax SHARE Smartphone Printer SP-2” is a newly designed product which has improved image quality compared to that of the “instax SHARE Smartphone Printer SP-1” and new functions to meet users' preferences and their lifestyle of taking and editing photos with smartphones. A higher image resolution and contrast are achieved with the adoption of a new exposure system of the “instax SHARE Smartphone Printer SP-2.” Also, the printing time has been shortened by combining the exposure and film output processes. When users send an image to the “instax SHARE Smartphone Printer SP-2” via wireless LAN, they can get photos in just 10 seconds. In addition, new filters and templates have been added to the creative experience of the free “instax SHARE” app. Using the “Custom filter,” the brightness, contrast and saturation of the image can be adjusted. With the “Collage template, ” two to four images can be combined into one instax photo and with the “Split template, ” one image can be split into two instax photos. 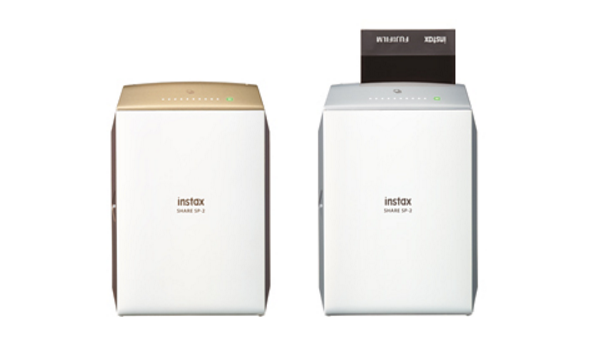 The “instax SHARE Smartphone Printer SP-2” is available in Gold and Silver. From the product design point of view, its body has been refined and finished to create a sophisticated appearance. 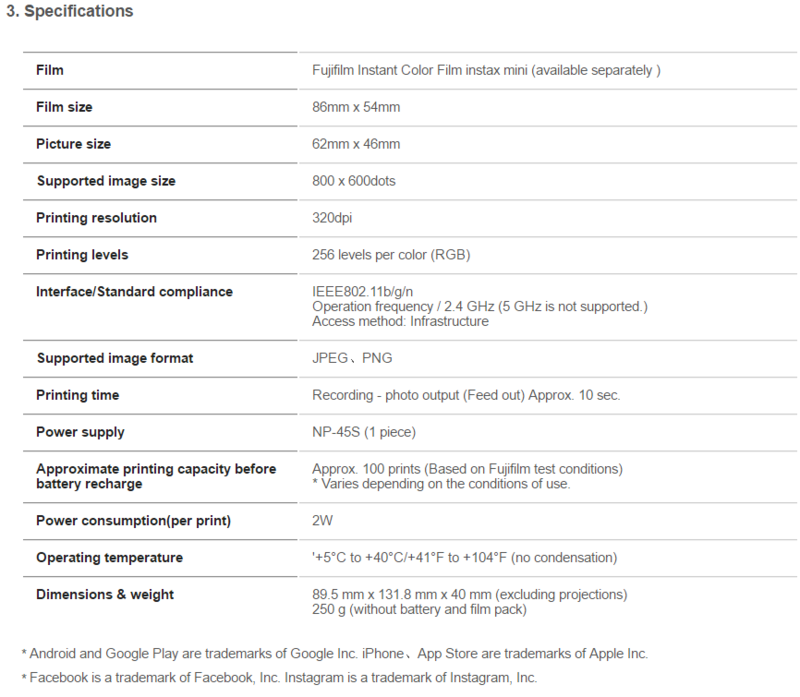 The “instax SHARE Smartphone Printer SP-2” demonstrates Fujifilm's commitment to continuing to expand the world of the instant photo system, “instax mini,” and “instax SHARE” which enables users to enjoy on-the-spot printing of photos, and deliver the fundamental photographic values of “shooting, preserving, displaying, and gifting” photos. 1. Create instax photos by printing images from iPhones and Android™ phones via instax SHARE app. 2. Images have a high resolution with print pixels of 800 x 600 dots and 320 dpi to show detailed gradations and the facial expressions of a full-length portrait, character or objects clearly. 3. A new laser exposure system achieves a faster printing time of 10 seconds from print data transfer to print output. Custom filter: adjust the brightness, contrast and saturation to create original instax photos. Collage template: combine two to four images into one photo. 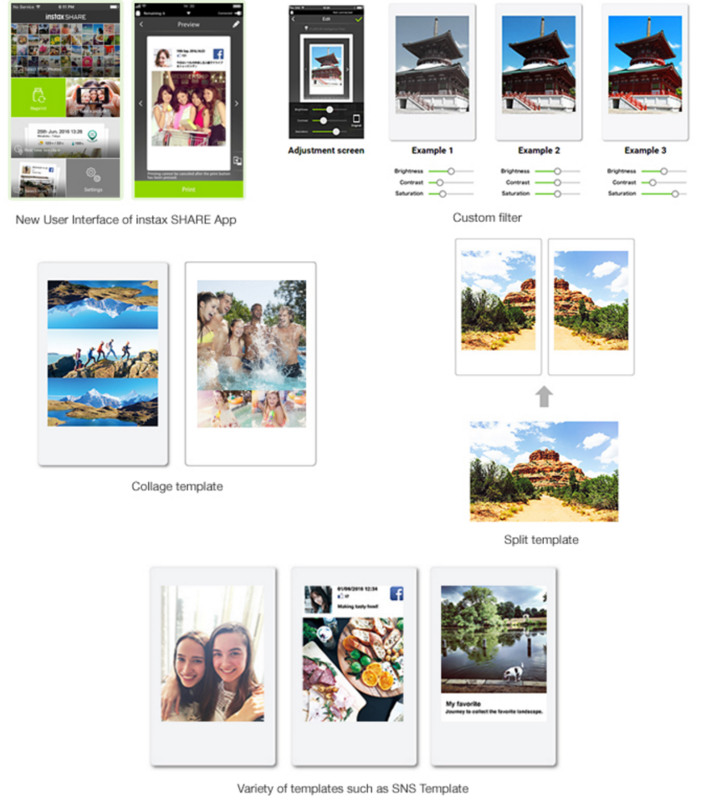 Split template: transform 1 picture into multiple instax photos. SNS Template: template for printing images that were uploaded to a social networking service (SNS). Real Time template: when the “Real Time Template” is selected and a photo is taken, the date, place, weather, temperature, and humidity are indicated in the frame. 5. The simple yet sophisticated design has a modern, sharp shape and rich colors. 6. Equipped with a rechargeable battery to charge via micro USB port.